Brother Tommy Freeman has been a wonderful friend and Christian brother since the late 1970’s. We had known about each other as kids playing baseball in the summers at the El Dorado Boys Club, but because he was 2 years older, we never played on the same team. Our current friendship began on the evening I gave the commencement address to the graduating nurses of Warner Brown School of Nursing in 1978. Brother Tommy’s sister Ann, whom I didn’t know at the time was a member of that class and Brother Tommy and wife Joyce were there. Joyce (Hawkins) Freeman was in my high school graduating class of 1957, so at that time I knew her much better than her husband. As part of my talk, I exhorted the nurses to use their new profession as a means to share the gospel with their patients, and not be intimidated, afraid or ashamed. I firmly believe the Lord Jesus has commanded us to be witnesses for him in whatever position or profession we find ourselves. Patients who are seriously ill and may be facing long-term disability or even death, need to know they have a Savior that loves them and He is able to heal them of all their diseases (Psalm 103). Following the ceremony, Brother Tommy and Joyce spoke with me, saying he was so glad to know a medical doctor who would witness to his patients and encourage those working with him to do the same. He asked if I ever spoke in churches, and I said I spoken in a few in the El Dorado area. He told me he was pastor of the First Baptist Church of Keo, Arkansas which is in Southeast Arkansas between Pine Bluff and Little Rock, and would like to arrange a convenient date for me to preach in his church. The date was set for the following month. The weekend Cathy and I spent with Brother Tommy and Joyce in Keo began a life-long friendship of our family with the Freeman’s. He invited me to preach and teach Bible studies in every church he pastored. We attended Bible conferences together and worked together during Christian Focus Week at Ouachita Baptist University in Arkadelphia. For a number of years we spoke by phone every few weeks, and he would ask questions about my teachings in the Sunday school class and what new churches I had been invited to speak. Without fail he would ask, “How many people have you led to the Lord since we last talked?” During that period Brother Tommy was one of my greatest spiritual encouragers apart from Cathy. Among men he rivaled my brother Berry Lee and was certainly more of a mentor than my own pastor at the time. In 1980, Brother Tommy was called to pastor the First Baptist Church in Prairie Grove, Arkansas. This town, though larger than Keo was a small town in Northwest Arkansas about 10 miles from Fayetteville. All of that part of the state was in the midst of a population growth and economic boom due to the 3 industrial giants headquartered there; Wal-Mart, Tyson Foods and J B Hunt Trucking Company. In mid-summer he called and said he had a ministry proposal for Berry Lee and me and wanted our opinions. He wanted to schedule a lay revival in the fall with both Berry Lee and me preaching and leading. The revival would begin on Sunday morning and extend through Wednesday evening. There would be 2 services on Sunday; one in the morning and one in the evening. Then there would be evening services on Monday through Wednesday. Berry Lee (Bubba) and I had never done anything like this, but after committing it to prayer, believed this was God’s will for us. We agreed Bubba would preach the Sunday noon service, and I would preach the evening services from Sunday through Wednesday. We called Brother Tommy and the date was set for November 16-19,1980. Early Monday morning following breakfast, Brother Tommy had scheduled us to begin visitation and did we ever visit! Typical of his entire ministry Brother Tommy’s goal was always to meet and know everyone in his community. 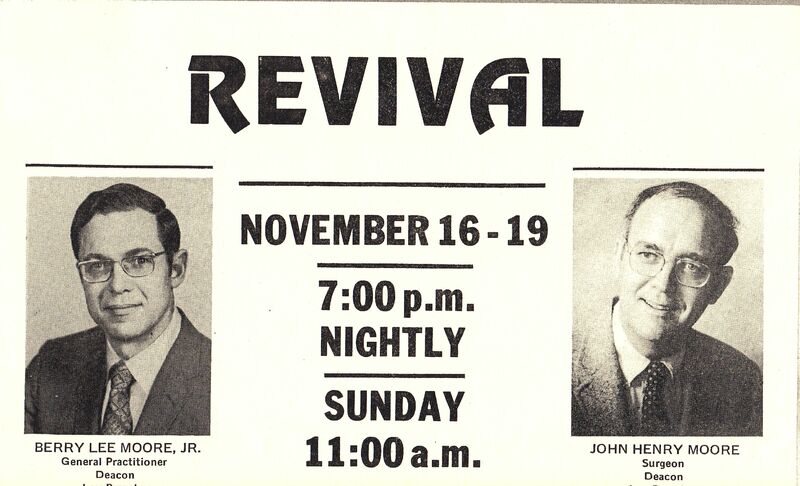 For this revival I believe his goal was that I meet and shake hands with every citizen in Prairie Grove, Arkansas, and I’m convinced before the revival ended on Wednesday evening, we had accomplished his goal. We even visited the lone physician in town at his office. He was a young family doctor with a very active practice, but had some unusual personal beliefs. First, his dress was unusual for that day because he wore bib overalls under his white coat. I was accustomed to the dress culture of the doctors in El Dorado who wore coats and ties in their practice. More significantly he said he was raised by a preacher father, but while in college he rejected the teachings of the church and embraced Daoism. I had no idea what he was talking about so couldn’t discuss with any intelligence his new-found religion. Later I discovered this was an ancient Chinese philosophical belief system in which believers were to live at peace and in love with everyone. Heaven was achieved for each person by living a loving life. The doctor respectfully declined our invitation to the revival, stating there would be nothing offered or said which he had not heard before.